Adapted by RHS English teacher Mary Ellen Dakin and RHS Science teacher Erin Parker from Making Thinking Visible by Ron Ritchhart, Mark Church, Karin Morrison, p. 64-70. As one of their “routines for introducing and exploring ideas,” the authors of Making Thinking Visible devised this thinking routine to encourage students to observe an image (a photograph, painting, map, chart, poster, book cover, etc.) closely in carefully chosen segments, and with each reveal to make and then revise their interpretations based on their growing knowledge of the image. The process can also be reversed: start with the whole image (the “big picture”) and gradually zoom in. attentively at it, allowing time for careful observation. You might want to begin with observations before moving to invite learners to develop opinions or interpretations based on what they see. They can do this individually, in small groups, or as a whole class. they are seeing and consider how this new information affects their previous interpretations. Depending on the image, you may ask more pointed questions: “What do you think the relationship is between the people / objects you observed in the first section of the image and this new section? What feelings are you getting from the words / numbers revealed so far? Do you have a prediction of what the next section of the image will look like?” At this stage, you might want to ask students about their wonderings as well. has been revealed and invite learners to ask any lingering questions they have. Encourage the learners to discuss their different interpretations and reflect how their thinking has changed with each new reveal. 4. Share the thinking. Reflect on how interpretations shifted and changed over time. How did seeing more of the image influence their thinking? Which parts were rich in information and had a dramatic effect? Which were more ambiguous? What would the effect have been if the reveals had happened in a different order? What is the effect of limited information on thinking? 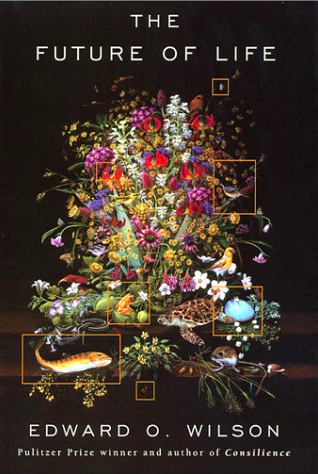 NOTE: The images in this examples were excerpted from the cover of E. O. Wilson's book not only for their beauty and visual complexity but because of the author's purpose. In a book that examines environmental challenges to the future of life, the cover depicts endangered and extinct species.